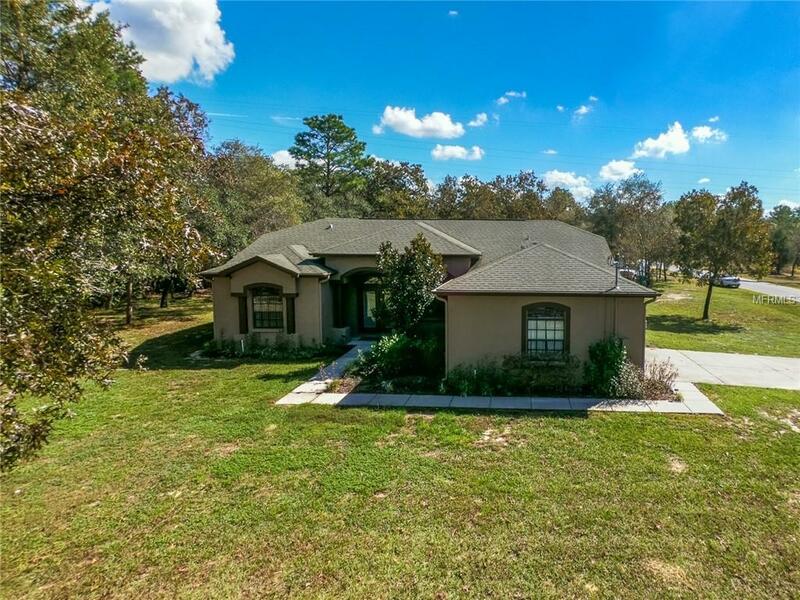 Amazing 2006 built POOL home on 1 ACRE lot with NO HOA and NO DEED RESTRICTIONS is waiting for the next family to love it and make memories that will last a lifetime..... Tastefully designed with the busy family in mind, this 4/3/2 features 2100+ sf of Functionality and Openness in a tranquil True Florida Environment offering TONS OF PRIVACY, No Backyard Neighbors and lots of nature. CUSTOM BUILT, this home features a 3-Way Split Floor Plan (3rd split is into a mother-in-law suite sharing bath to pool), Formal Dining/Living Room Combo ( w/ pocket sliders to pool), Open Kitchen (stainless steel appliances stay! above shelf lighting, double well sink and breakfast bar), Dinette overlooks Sparkling 25X14 Self Cleaning Salt Water Pool with 35X21 Screened Enclosed Lanai, Huge Family Room (pocket sliders to pool), bedrooms 3 and 4 share a spacious bath and are comfortably tucked away on their own side (2nd split to floor plan) :) The Master Suite is super spacious, offers a PRIVATE SITTING AREA ( 8X8 with private access to pool), His and Her Walk-In Closets and has an Open Master Bath with room. Other Amenities: 4 year NEW Pool Heater, Security System w/ Cameras installed, Tile and Laminate flooring, Sprinkler System, Surround Sound in LR, FR and Pool/ Lanai, Rain Gutters, SHED, Private Indoor Laundry Room with 48" cabinet for storage of odd's and end's and Sink for soaking stains and bathing pets; Cool Decking recently painted. Water is Weeki Wachee Aquifer!!! and is YUM..... Easy to Show.